Stop fumbling with the pump on your belt. You went on the pump for flexibility, why are you still wearing it on your belt? 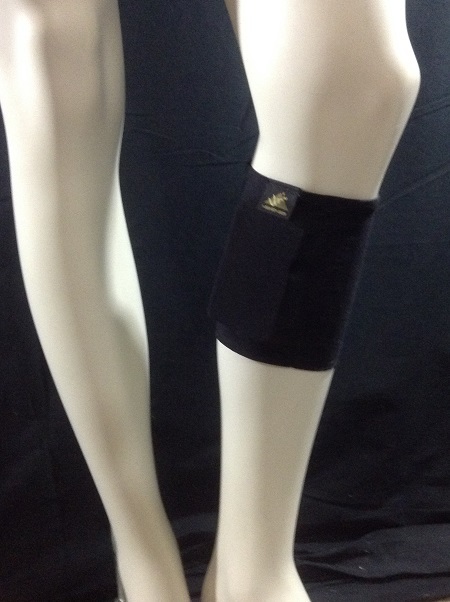 The Leg-Thing is made of nylon/spandex and is worn like the top of a sock on the calf. Put the pump down your pant leg and into the leg-thing inner pocket. The specially designed pocket, holds your pump secure with a Velcro closure. Great for long dresses too. Available in Black or White. If you have trouble with the Leg-thing slipping, you can turn your leg thing inside out and run a seam up the side to tighten it. You can also go to Amazon.com and type in Body Adhesive. They have many roll on body adhesives that will help keep the leg thing from slipping. Visit our Thigh-Thing page for more details. Alterations available just email us and let us know how much to take it in before we send it.